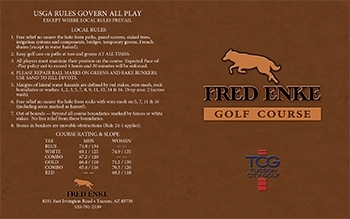 Fred Enke offers golfers an interesting and challenging approach to golf course design. The major features of the course are its vast teeing areas, large greens, strategic bunkers and sand traps, and most important of all, its concept as a semi-arid, limited turf course. Grass is used only on the tees, ball landing areas, and greens, with undisturbed native plants comprising the remainder of the landscaping. 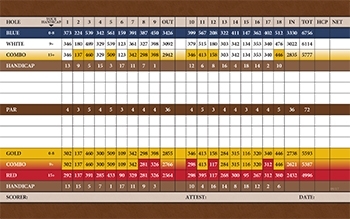 Golfers have the option of four teeing areas. They range from 6,800 to 5,000 yards. Because of the hilly terrain, golf carts are recommended.